Recruiters around the world are widening their search and casting their nets into a growing pool of international talent. At the same time, demand for business leadership talent with experience outside the United States has increased exponentially. And as the demand for global talent increases, the world's #1 choice for virtual MBA recruitment technology continues to expand its global network. "The competition for global MBA talent has never been so intense," says Tony Somers, Director, MBA Career Management Center, HEC School of Management. "Our new partnership with MBA Focus will give employers access to the elite management talent at HEC Paris and give our students access to an exclusive network of multinational corporations." For more than two decades, top-ranked MBA programs -- and the companies that employ their students and alumni -- look to MBA Focus for advanced recruiting technology solutions, best practices, thought leadership, and innovation. Today, leading MBA employers can search an aggregated database including students and alumni from 74 top-ranked business schools, including 20 MBA programs located outside the United States. Three new international schools have joined the network this year: HEC (Paris), IESE (Barcelona), and IE (Madrid). And Hult International Business School expanded its GTS partnership to include five new global campuses in Dubai, Shanghai, London, San Francisco, and Boston. These new school partners, and the 70 other top-ranked graduate business schools, make MBA Focus the most comprehensive global recruiting network available. Currently, 90% of the companies using the Global Focus recruitment tool are multinational corporations. This has helped MBA Focus deliver an ever-expanding range of MBA-preferred opportunities to MBA talent in North America, Europe, and Asia. Currently, 56% of 2011-2012 students registered with MBA Focus have experience outside the US, while 57% of those students are seeking employment abroad. The growing demand for MBA talent with international work experience and work authorization is expected to continue. As a responsive and trusted partner to the world's top employers and leading graduate business schools, MBA Focus plans to further expand its international network. 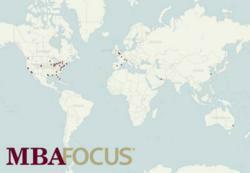 MBA Focus is the market leader in MBA recruiting — connecting leading employers with the world's top-ranked graduate business schools. Their exclusive school partnerships and industry-leading recruitment management technology products make them the #1 choice of companies seeking top MBA talent. This press release was distributed through PR Web by Human Resources Marketer (HR Marketer) on behalf of the company listed above.